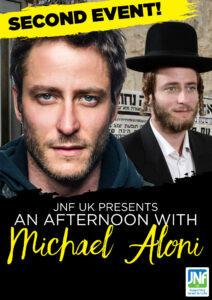 Please email ceyda.baser@jnf.co.uk to put your name on a waiting list. Michael Aloni will take you behind the scenes of popular Netflix series ‘Shtisel,’ with an insight into his character as well as secrets from the set. You will be given the chance to ask some questions in a Q&A with the main man himself. With special guest host, Yaron Brovinsky. All proceeds from this fundraising event will go to our project Yad Tamar, supporting cancer patients in Israel. NB: Photography will be taken at this event, should you wish to not be featured in our photography, please let a JNF UK representative know at the event.